We asked Steve Kemble, America's Sassiest Lifestyle Guru, to give us some fabulous inexpensive party ideas. With more than 20 years of experience, Steve has planned events for big names in sports and entertainment and even two United States Presidents. His style and personality have made him a frequent guest on television programs such as Entertainment Tonight and E! 's Countdown to the Oscars. 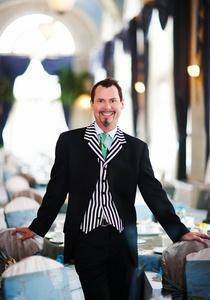 In addition, Steve's skills have earned him a place in the Event Industry Hall of Fame. Yet not every event has to have a Hollywood-sized budget. Steve claims, "I feel firmly that you can still give your soirée some glitz and glamour without breaking the bank!" and offers the following inexpensive party ideas. First and foremost, determine how much you can afford to spend on your party and then invite guests accordingly. The amount you can invest into your fete will help you determine the number of guests you can realistically entertain without breaking the bank! Just don't forget to invite me! I love parties! Additionally, be sure and ask for an RSVP; this will enable you to better monitor your budget. Consider asking a friend, neighbor or business associate to help you co-host. Not only will sharing duties help with the monetary aspect of the event, it will also bring some new and fresh ideas to your party! You divide the party expenses with your co-host and you can also delegate the responsibilities during the party itself - no one wants dishpan hands! Create a fun and unique invitation at home. Not only will your hand-crafted invitation provide memories for years to come, it's just plain fun to make! There are many times a day a fabulous party can take place; it does not have to occur just in the evening. Consider hosting a holiday breakfast or brunch, or even an afternoon tea! One of my favorites is to have a dessert party. Guests can come over after they have been to a dinner party or other soirée. Additionally, don't be shy about asking your guests to bring their favorite dessert to the party. Not only is this wonderful for conversation, it will greatly help you with your budget. Who does not like wonderful coffees, cordials and delectable desserts! With your budget in mind, I very much encourage you to set a time limit to your party of two hours. A good party does not have to go on to wee hours of the morning! Many people think that if they host a party, it must be a cocktail party. A great gathering and mix of friends and associates can take place in many wonderful and budget-conscious ways. For example, consider hosting a movie night with flavored popcorns (everyone loves a good movie classic) or a games night, with a collection of your favorite board games and wonderful snacks! One of my favorites is to be invited to a fantastic wine-tasting and fondue party! If you don't have that perfect serving piece, stemware, table linen or decor piece, consider borrowing it from a friend or relative instead of buying it! Once you have determined your menu and have borrowed some fabulous serving pieces, think about what you can do to dress up the presentation without spending a lot of money. One of my favorite examples is to think about how much more amazing a pitcher of water looks when you simply put lemon slices in it. Dress up your service trays with wonderful leafy lettuces and other garnishes. It is not so much about having lots and lots of decor but making what you have look fabulous! For example, consider using lots of candles. Candles are the most cost-effective (not to mention romantic) way to create an atmosphere. One of my favorite party "tricks" is to change the light bulbs in my lamps from bright white to a soft pink; it is amazing the wonderful glow this creates (and everyone looks more fabulous out of bright white light!). Another great party "trick" is to rearrange your furniture in clusters, much like you would see in a hotel lobby. Not only will this give your home a new look for the party (without buying anything new), it will also create conversation areas and nooks for your guests. If you think about it, many times when people come to your home they move your furniture around anyway to be able to converse with other guests, so why not do it for them! Ask your guests to dress in a particular color for your party. You will be amazed, for example, if you ask everyone to dress in red, the impact this will have (not to mention the free decor!). No one likes a frazzled host, so be sure and leave plenty of time for yourself on the date of your soirée! It is never a good idea to stress yourself out over trying to impress your guests. Leaving ample time to relax at home before your guests arrive will not cost you a thing and will make all the difference in your fabulous, but frugal, party!